How are people that live on the streets in Barcelona vulnerable? This question wants to answer The Vulnerability of People Living on the Street in Barcelona, a document that is focused on learning more about the people who sleep on the streets of Barcelona every night and wants to offer useful information that allows social organizations and administrations to design better solutions to the problem. A census where we interviewed 348 people who sleep on the streets of Barcelona. A survey of citizens of Barcelona to learn their perception. Interviews with three professionals who are experts in health and human rights and defences from around the world. You can read the proposals we’ve made to the city. You can also download the entire document as a PDF (the document is in Catalan). From May 30th – June 1st 2016, Arrel’s organized a city wide, night time census of Barcelona. 284 organized volunteers who have been trained by Arrels walked the streets of Eixample, Ciutat Vella, Sants-Montjuïc and within the neighbourhoods of Les Corts, Gràcia and Sant Martí to speak with people who are sleeping on the street there. We wanted to know who sleeps on the street in Barcelona, who uses Social Services or emergency center’s in hospitals, what state their health was in and what other risks they might be suffering from. The ultimate goal was to learn how vulnerable the people who sleep on the street are. Of the people we interviewed who sleep on the street, 19% of the people had a high degree of vulnerability. 61% had a medium degree and 20% had a low degree of vulnerability. If we apply those numbers to the 941 people who sleep on the streets of Barcelona, it would mean that 178 of those people would present a high level of vulnerability. For these people, a priority social intervention based on the Housing First model is required. 70% are rooted in homelessness. 70% of the people who responded to the survey reported living on the street for more than a year. They require specific resources so that their situations do not get worse and they lose confidence in the social protection system. 66% of the people interviewed are immigrants from 46 different countries. This requires them to overcome administrative barriers that come from local, autonomous and state administrations. 47% have had no contact with social services or similar programs in the last six months. We ignore the reasons if they are related to the unawareness of the aid availability or if they have to do with the capacity to offer help from the same resources. Who sleeps on the streets of Barcelona? Of the 348 people who sleep on the street that responded to our survey, 86% are men and 10% are women. 31.3% are Spanish and 66.04% are from other countries. On average, those interviewed have gone 3 years and 9 months without a stable home and 70% have spent more than a year living on the street. According to those interviewed, 1 in 5 cannot afford their basic needs and 3 out of 4 do not have any type of income. Also, 1 in every 4 has had problems accessing some resource because they are not registered. How do homeless people use the services of the city? In Barcelona, as well as the rest of Catalonia, any citizen who needs medical attention has the right to be seen by a doctor or to be attended to by a social worker. In this sense, 47% of the people interviewed who sleep on the street have stated that they have not been cared for by any social worker or received similar aid; 1 in every 3 people said they have received emergency medical care in the last six months and 18.9% said they have been admitted to the hospital. 50% of the people interviewed who live on the street say they have a health card; in the case of people from Spain, that number rises to 72.47 %, but in the case of immigrants, only 39.33% have a health card. 1 in 4 people have trouble asking for help when they are sick and 1 in every 5 says they suffer from chronic diseases. Problems with physical and mental health and substance abuse make people living on the street more vulnerable and even condition that they can access a home. According to the people we interviewed who live on the street, 37% have been a victim of physical and/or verbal aggressions and 12.6% said they have been forced to do something against their will. Of the women interviewed, 47% claim to have been victim of some form of aggression. 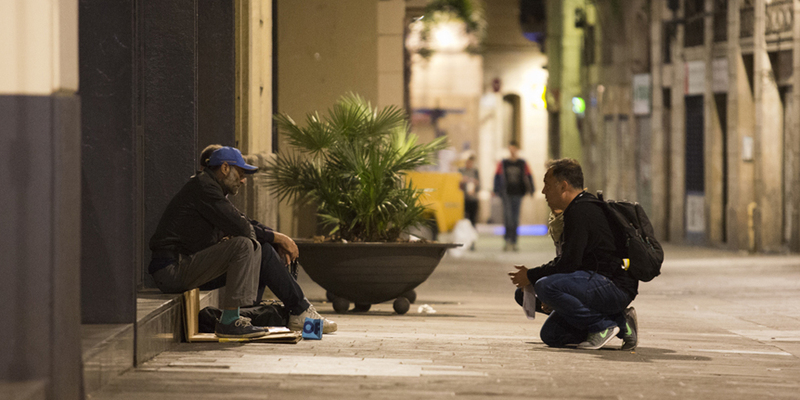 Along with the homeless census, we surveyed 1,003 citizens of Barcelona to learn their perceptions about people who sleep on the streets in Barcelona and to do an exercise of comparison with the opinions of homeless people. The citizens of Barcelona consider homelessness to be a prominent problem that be tackled in an effective, coordinated way. For example, 4 out of 5 people believe we must recover the rights of people because sleeping on the street is not normal. Along with the voices of the people who sleep on the street and of citizens in Barcelona, we have also added the visions of three outside professionals. Their experience helps people understand issues such as the fragile situations of homeless people, like those without documentation, as well as the perception someone might have on their health and the use of different resources offered by the city, as well as others.